What happens to your pets if something happens to you? Do you ever worry about what would happen if you ever got in an accident and couldn't communicate that your beloved pets are home alone? 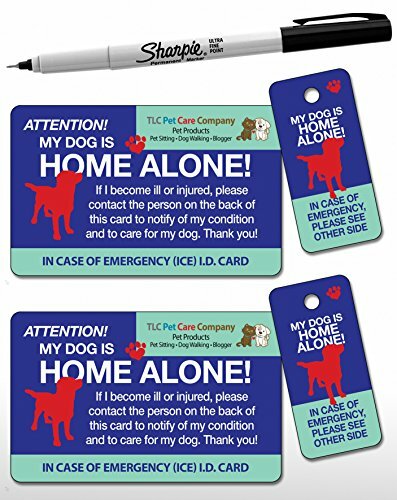 Based on feedback from friends and clients, TLC Pet Products has developed this glossy plastic credit card stock ""Home Alone" pet emergency ID wallet card and key tagthat fits easily in your wallet or phone pouch and place on your key ring, with room to write your contact person's details that will alert emergency personnel to contact your ICE person regarding your predicament and that your much loved pets are home alone. These are definitely vital cards to have in your wallet and on your keychain. ENSURE YOUR PETS' PROTECTION & SAFETY: If you are in a situation where you are hurt and can't speak, this card will do the talking for you. DOUBLE DUTY AS YOUR OWN PERSONAL IN CASE OF EMERGENCY (I.C.E.) CARD: Since the card and key tag have all of your information and list any medical condition(s) or allergies you may have, your contact will be alerted and will be able to notify any family members. 100% MADE IN THE U.S.A. 30 MIL PLASTIC CREDIT CARD WEIGHT WITH A FULLY WRITABLE SURFACE ON THE BACK. DESIGNED BY A PROFESSIONAL PET SITTER WHO IS ALSO A PET OWNER. BRIGHT AND BOLD COLORS ARE HIGHLY VISIBLE FROM A FAR: These cards fit easily in your wallet or phone pouch and the key tag can be easily attached to your key ring. ENSURE YOUR PETS' PROTECTION & SAFETY: If you are ever in a situation where you are hurt and can't speak, this card and key tag will do the talking for you. First responders can alert your contact people that you are hurt and that your pets are home alone. We hope you never have to use your card, but when you're prepared for urgent situations, it makes all the difference for your family and pets! PERFORMS DOUBLE-DUTY AS YOUR OWN PERSONAL MEDICAL I.C.E. CARD: Since the card contains information that lists any medical condition(s) or allergies you may have, blood type and medications that you take, first responders will be alerted so that they can perform treatment without compromising your health. 100% MADE IN THE U.S.A. 30 MIL TESLIN PLASTIC. FULLY WRITABLE MATTE SURFACE ON THE BACK. FOR BEST RESULTS, PLEASE FOLLOW DIRECTIONS. SHARPIE ULTRA FINE PERMANENT MARKERS WORK BEST. They will make your text dark and crisp without any rub off. Other markers or pens may not work as well. Wait for ink to dry a few minutes before putting away in your wallet. TIP: For extra protection, put tape over the written area to ensure no rub off with occur. SHIPPING IS ALWAYS FREE FROM TLC SAFETY BY DESIGN. If you are an Amazon Prime Member, you automatically receive free 2 day shipping. If you are not a Prime Member, you can order from one of the options that include "from TLC" in the option title and you will receive FREE First Class USPS postage with tracking - a $3.00 value. CARDS AND TAGS ARE AVAILABLE WITH DIFFERENT OPTIONS TO BEST SUIT YOUR BUDGET and NEEDS. Choose from these options: CARD WITH KEYTAG only, SHARPIE option with card, key tag and 1 Sharpie or the COMPLETE BUNDLE with card, key tag, 1 Sharpie, tag holder and luggage bag tag loop. Ordering any of the options that contain the words "Qty. 2 from TLC" and "Qty. 4 from TLC" receive quantity discounts for multiple card purchases in same order. If you have any questions about this product by TLC Safety By Design, contact us by completing and submitting the form below. If you are looking for a specif part number, please include it with your message.